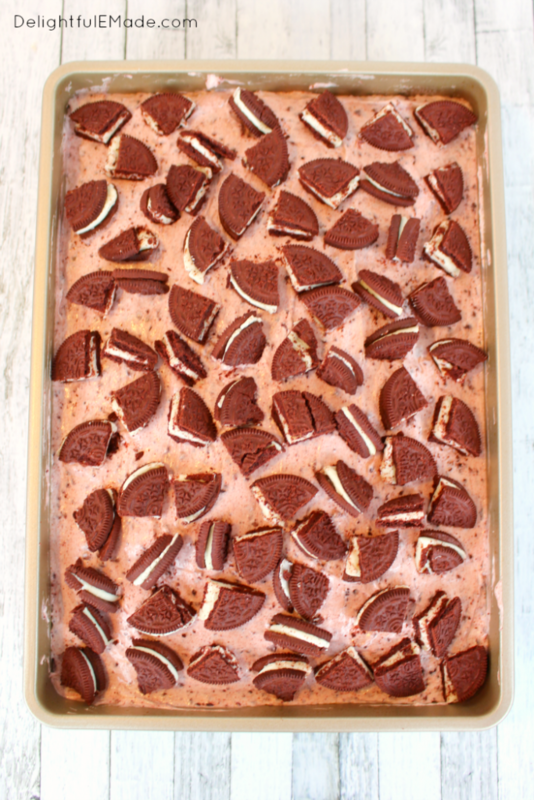 This Red Velvet OREO Poke Cake recipe is an oreo lovers dream come true! Topped with a delicious cream cheese filling and loaded with Red Velvet OREO’s, this red velvet poke cake is the ultimate dessert! 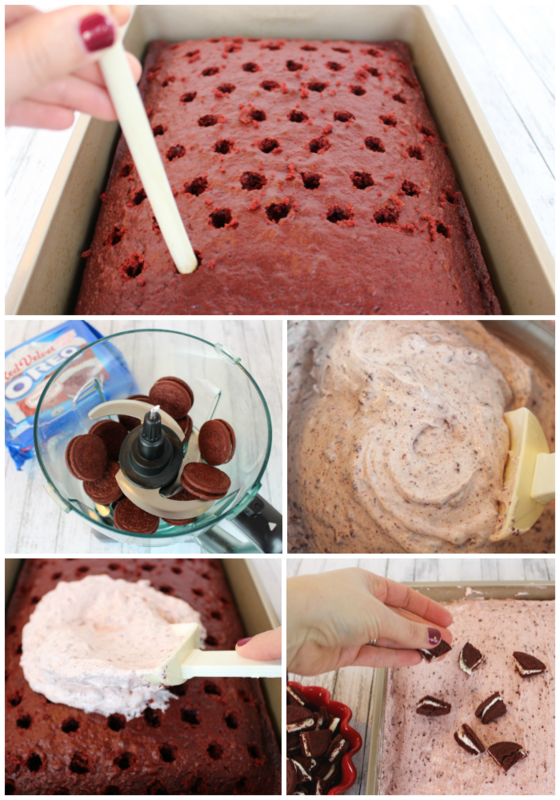 Red Velvet OREO Poke Cake recipe – an OREO Lovers dream! 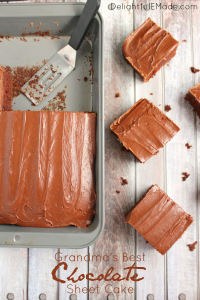 If you love red velvet, then this red velvet poke cake recipe is a must-make! 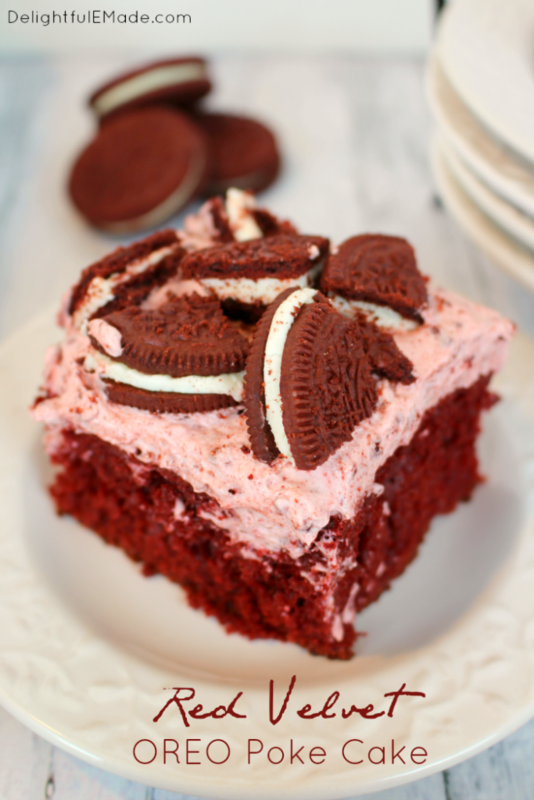 Topped with a delicious cream cheese filling and red velvet oreos, this delicious cake recipe is amazing! 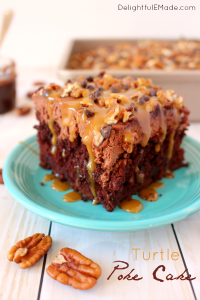 This fun cake recipe is fantastic for a Valentine’s Day treat or a fun birthday cake. Like this recipe? 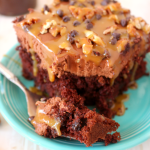 Be sure to pin it to your CAKE or DESSERTS board on Pinterest! Coming from a small rural farm town in South Dakota, I was never exposed to the beautiful bright red dessert known as red velvet. I think my first introduction of the dessert is in the movie “Steel Magnolia’s” where the ladies are talking about the Armadillo grooms cake at the wedding being red velvet cake with gray icing. From then on, there was a curiosity in me that immediately wanted to try red velvet cake! I now live in the south where red velvet cake is a staple in just about every home. It is just as celebrated as pecan pie, sweet tea and bbq! I’ve since tried and made several red velvet desserts, like my Red Velvet Donuts with Cream Cheese Frosting and my Red Velvet Candy Cane Kiss Cookies, and have fallen in love with the chocolaty, deep red, delicious dessert! As soon as OREO came out with their new Red Velvet OREO’s, I knew right away that I must come up with a delicious dessert perfect for celebrating this classic southern flavor. 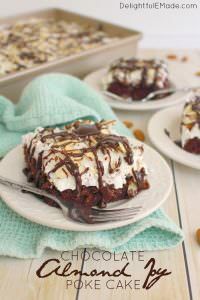 Red Velvet Poke Cake – one of many poke cake ideas! I love making poke cakes! 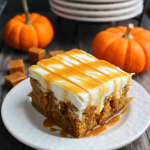 This cake was actually inspired by my super popular Pumpkin Caramel Cream Cheese Poke Cake and my Coconut Cream Poke Cake. 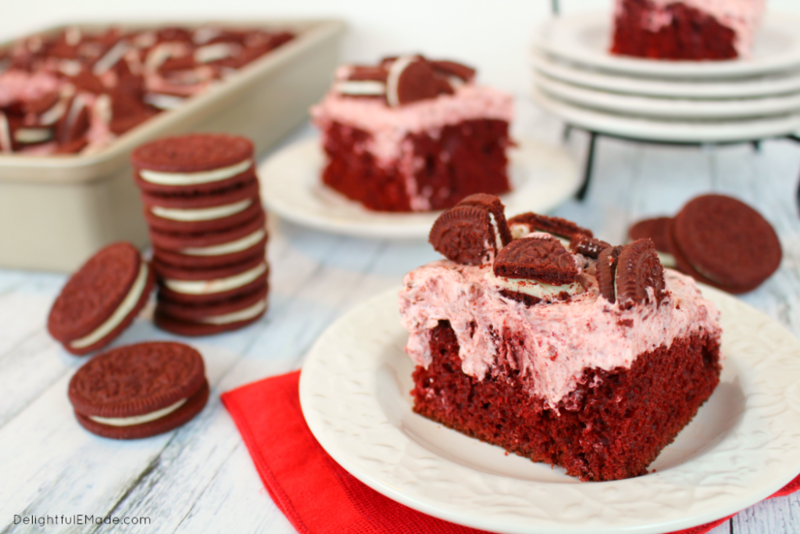 I thought that pairing these awesome Red Velvet OREO’s with the classic red velvet cake and a creamy, delicious cream cheese filling would be a perfect fit! Making a poke cake dessert would be the perfect way to marry the flavors and textures together. Naturally, the combination of the cream cheese filling, with crushed red velvet OREO crumbs is a home run! 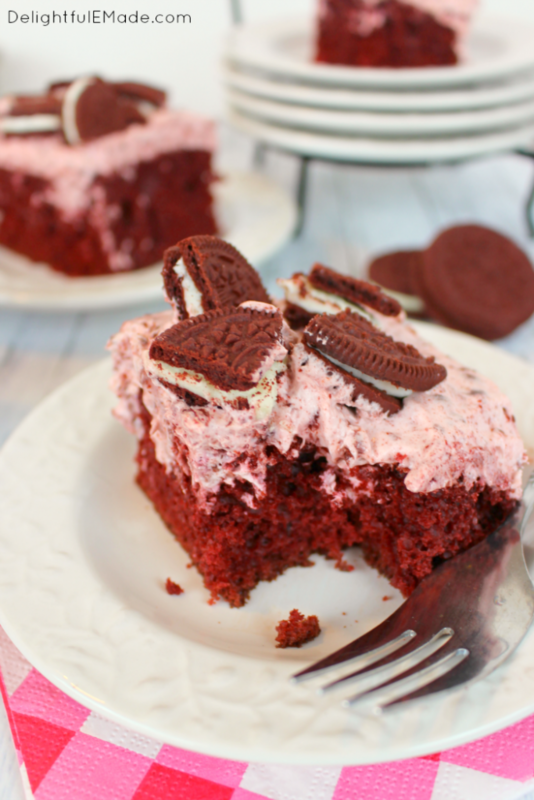 This cake is my new favorite way to enjoy Red Velvet – I love the addition of the OREO’s as the crunch is a fantastic texture that pairs wonderfully with the creamy filling and delicious cake. Making a poke cake is not only simple, but a great way to add extra moisture and flavor to any cake. 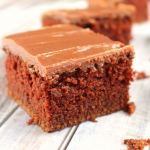 I used a boxed cake mix for this recipe, as it’s not only a great time-saver but it’s a fool-proof way in getting the flavors just right. However, if you would like a homemade Red Velvet Cake recipe, my Red Velvet Sheet Cake is fantastic. 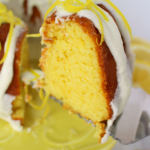 The delicious cream cheese filling sinks into the holes of the cake, bringing additional flavor and texture. Topping this dessert with additional pieces of OREO’s is a must. The crunch of the cookies is fantastic! A red velvet cake lovers dream! 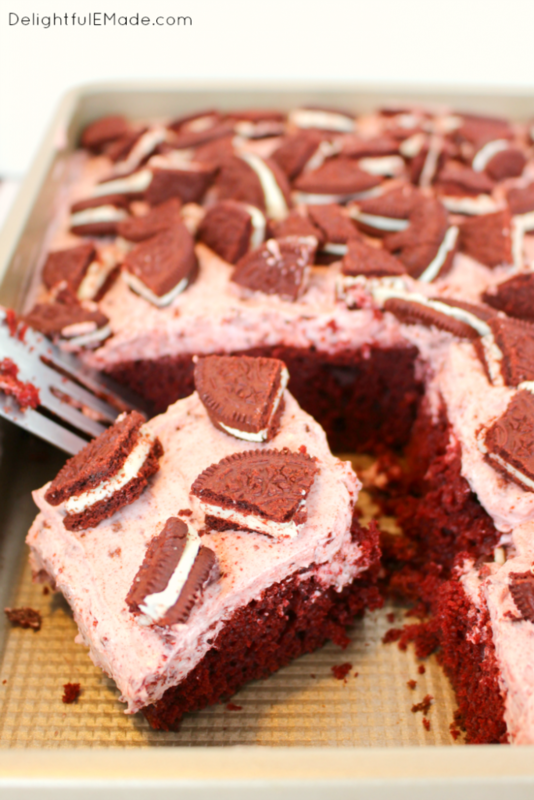 Red velvet cake topped with a delicious cream cheese filling and loaded with Red Velvet OREO's. 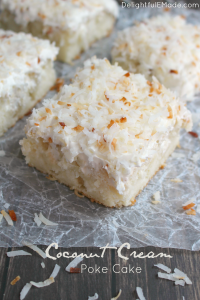 The ultimate dessert perfect for any occasion! Preheat oven to 350 degrees. Spray a 9x13" pan with non-stick baking spray. Set aside. In a mixing bowl, add the cake mix, eggs, water and oil. Mix with a hand or stand mixer, or by hand using a whisk. Mix until the batter is lump-free. Pour the batter into the prepared pan and bake for 30-32 minutes. Remove from oven and let cake cool. While cake cools, make the filling. In a food processor or blender, crush about 10 OREO's into crumbs. Set aside. With a hand or stand mixer, beat the cream cheese and powdered sugar until creamy. Add the milk and mix. Add the OREO cookie crumbs, and fold together. Lastly, fold in the whipped topping, and mix until just combined. With the end of a wooden spoon, poke holes into the cooled cake, spacing the holes about 1" apart. Next, add the filling to the top of the cake, pressing the filling gently into the cake to help it go into the holes. Spread evenly. Cut the remainder of the OREO's into quarters, and sprinkle over the top of the cake. Refrigerate for at least one hour or overnight. Drooling...that's all I got to say. :) Thanks so much for sharing at Oh My Heartsie Girls Wordless Wednesday! 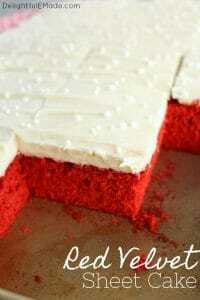 You just made the classic red velvet cake even better!!! I love poke cakes! This is awesome! holy smokes!!!! This looks intense, but in the most wonderful way possible! Sweet fancy Moses. I never would have thought of red velvet and oreo together. It's genius! And....it's making me really hungry! Yum! This looks perfect for Valentine's Day! Wow, that cake looks really good! This looks amazing! I love a good poke cake. Can't wait to try it!! Lord, have mercy. I. Want. NOW. Pinning!! Stopping by from Turn It Up Tuesday! This looks yummy! I would love to try this because it is quite different. Can't go wrong with oreos! Thanks for sharing at the What's for Dinner Party.